It’s a cheesecake! No, it’s a brownie! 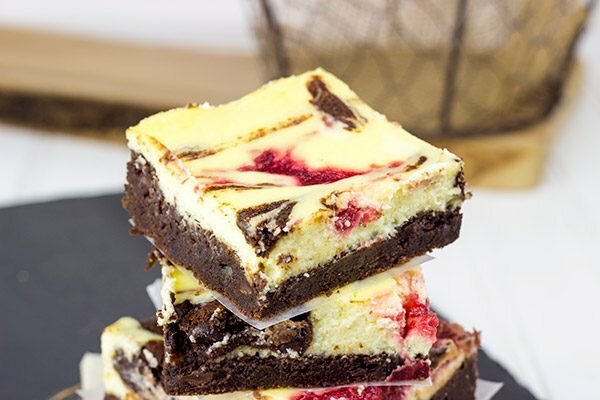 No, it’s Strawberry Cheesecake Brownies! When is a cheesecake not a cheesecake? 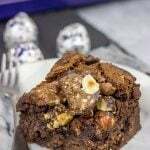 When it’s a brownie of course! And when is a brownie not a brownie? When it’s a cheesecake. Obviously. 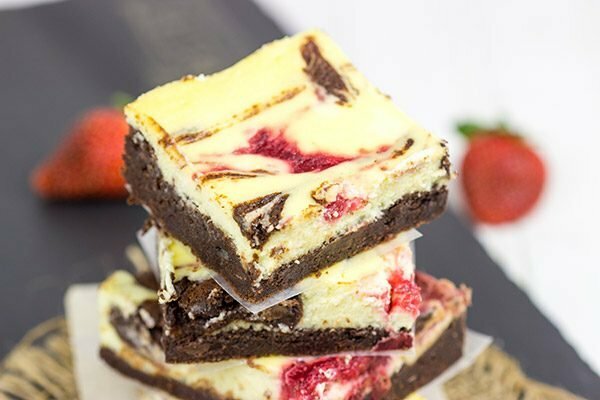 I’ve combined two of my favorite desserts into these magical Strawberry Cheesecake Brownies. You know those times when you can’t settle on what you want for dessert? Well these cheesecake brownies solve that problem! So we’re almost 1/4 of the way through 2016. Wait. Doesn’t it seem like New Years Day was just a couple weeks ago? Sure enough, time flies. Or as the Pope likes to say, tempus fugit. Back at the end of last year, I stumbled across a New York Times article titled ’15 Ways to be a Better Person in 2016′. Ok, bait accepted. We all want to be better people, right? We used to read every night before bed, and I’ve recently tried making an effort to go back to reading each night. Of course, with Robbie around, we usually pass the heck out as soon as we have the opportunity…but the point still remains. It’s ok to detach from the social world for a bit. And for the record, I appreciate the irony of a blogger saying it’s important to detach from the social world. As bloggers, we’re expected to live our lives 100% connected to Facebook, Instagram, Twitter, and every other network you’ve heard about…and some you haven’t. But it’s ok to put the phone down and pick up a book. Anyways, enough of my rambling on smart phones, smart watches, smart refrigerators, smart cars, etc. etc. I just want my dumb book. 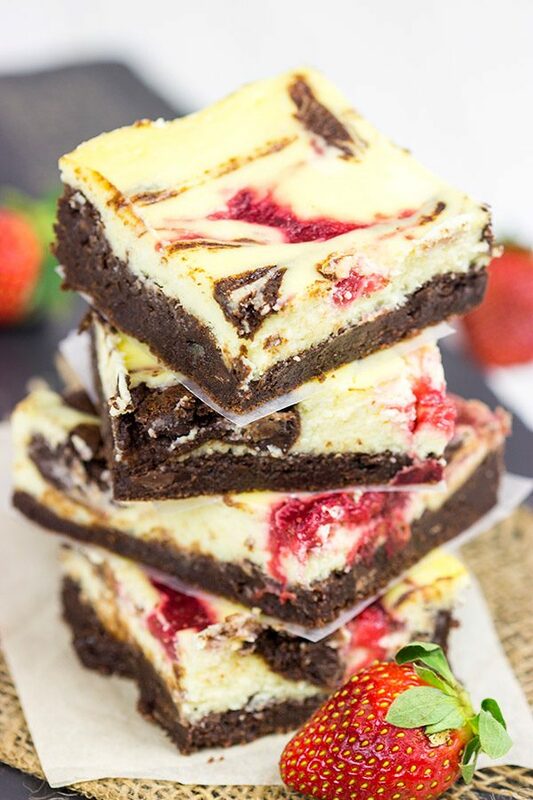 Back to these Strawberry Cheesecake Brownies…that’s why you stopped by in the first place, right? My go-to brownie recipe got down on one knee and proposed to my go-to cheesecake recipe. Somewhere along the way, a couple of strawberries joined the party, and the result was these Strawberry Cheesecake Brownies. 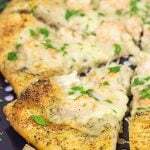 Warning: this isn’t the quickest recipe to make. You pretty much have to mix both a cheesecake batter and a brownie batter. But the result is so worth it! I cut the edges off of these cheesecake brownies before taking the pictures, and then I couldn’t drag myself away from the cutting board full of scraps. These bad boys are that good. Cheesecake or brownies? Or both? Smart phone or dumb book? 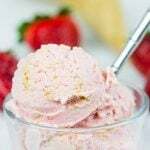 Using a small food processor or mini-chopper, add the strawberries and cornstarch. Puree until smooth. Transfer strawberries into a small sauce pan. Place over medium-high heat, stirring occasionally, until mixture begins to boil. Boil for 2 minutes, stirring constantly. Set strawberry sauce aside. Using an electric mixer, beat the cream cheese on medium speed until completely smooth (~3 minutes). Whisk the eggs and egg yolk together and add to the bowl in 2 additions, mixing fully after each addition. Grease and flour a 9”x13” baking pan. Line bottom of pan with parchment paper; set pan aside. Remove ½ cup of brownie batter; set aside. Pour remaining batter into prepared baking pan. Pour cheesecake mixture over brownie batter. 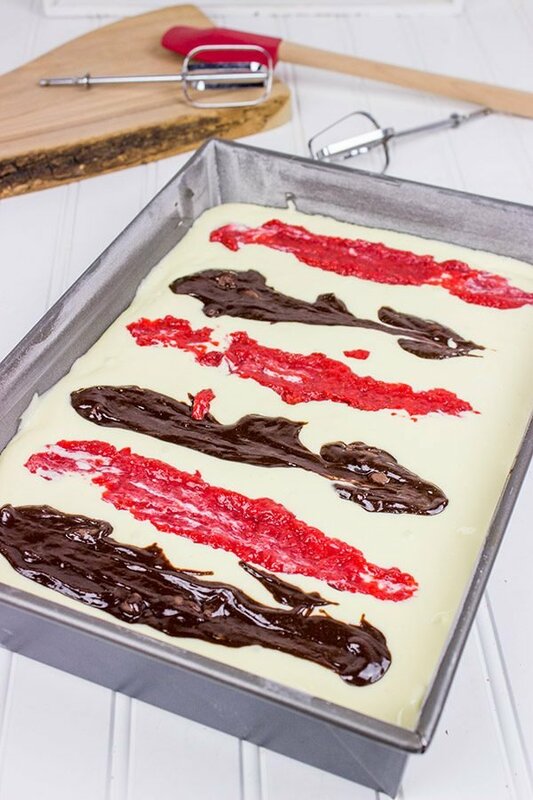 Make 5-6 alternating lines of strawberry sauce and brownie batter on top of cheesecake layer. 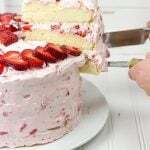 Use a toothpick or skewer to gently swirl the lines together. Bake at 325°F for 50-60 minutes, or until top of brownies is just set and a toothpick comes out mostly clean. Now that you’ve combined these two desserts, I’m never picking between them again – that was a stroke of pure genius! These look incredibly (and dangerously) delicious. I used to read in bed until recently, when I switched over to scrolling through Instagram…I think it’s time to switch back, though! I completely agree with you. We’re back to reading book (which translates to ‘sorry dear readers, I’m not ignoring you. I’m just re-energizing here). And this cheesecake brownies will make a perfect companion while reading or doing social media. Yum! Hi David! 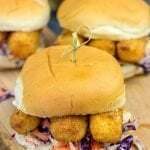 These are on my list to make as soon as we finish the chocolate chip cookies and the coconut cake I made. How could anyone resist! These would also be good with raspberries! Much to my son’s objections, I don’t have a cell phone – give me a book and I’m a happy camper! So I’m not sure how you do it without a cell phone, Dorothy. That would be difficult! But the problem arises when you get a cell phone and then start playing with all of the apps out there. Talk about a huge time sink! You know me and my love of reading. Give me a good book, and I’m a happy camper, too! 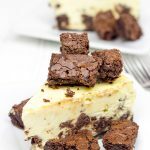 Brownies and cheesecake are also two of my favorite desserts! This looks incredible and I wish I had a bar (or 3) right now. We clearly share the same dessert brain, Bianca! I wish I had a bar (or 3) of these right now, too…but sadly, they’re all gone. Maybe another batch needs to show up soon! I totally agree, Jess! I love brownies, and I love cheesecake…so why not merge them into one awesome dessert?? And, oooh – I need all the excuses I can get to drink MORE coffee and the fact that drinking more coffee can make me a better person – why, I guess I better up my intake! Besides, when you mix coffee with these Cheescake brownies, you cannot feel like you are experiencing a tad bit of heaven! You combined 2 of my favorite desserts into one! this look crazy good David! and totally agree with you on detaching from the social media for a bit. It really gets overwhelming at times, especially as a food blogger! I like the idea of reading before sleeping, that’s the way it should be! It’s so difficult to detach from social media/phones (darn you, iPhone games)! We’ve been good about trying to read a little bit before bed each night, so my plan is to keep that habit going. It’s way better than staring at a tiny little screen anyways! This is so convenient! Usually, I have to eat my brownie, and then my strawberry cheesecake, but this way I can have them both at once. Highly efficient. Your logic is impressive. That’s what I’m here for, Jeff. To save you time on those nights when you want a brownie and a slice of strawberry cheesecake. You can thank me later. What a delicious marriage. Mate, these look amazing! Haha! It’s definitely all about balance, mate. You know, the whole yin and yang thing. Very similar to the whole brownie and cheesecake thing. Just different sides of the same coin, right? I love both these desserts, but then I love desserts period. I like the lighting in your pictures, makes everything looks so fresh. Thank you so much, Muna! Desserts are definitely my weakness, too. I agree with you that social media can get you worn down. Hang in there, though! 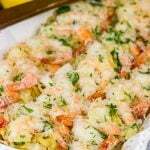 Wouldn’t it be nice if we could just cook and post recipes without all of the other stuff that goes along with it? But I’ve met some fun people in social media (including you! ), so that makes all of the mundane parts so much better. Are you sure there wasn’t any point regarding lavender in that list, David? If it’s so…well, it’s obviously a wrong list. Disregard it. I’ll send you an amended one:) And sure I love this cheesecake aka brownies aka cheesecake-brownies! Dear David, I cannot believe how quickly these last few months have gone by…and yet they have felt longer due to the winter. It must be my generation but I have no problem turning down the phone past a certain hour. Easy solution: just put the phone away a half hour before bed and then you can be all self-righteous about how you read yourself to sleep. Or not. We’re all on our devices too much, civilization falling apart, and so forth. These look INCREDIBLE. No need to put a limit on the eating of the cheesecake brownies! Yup, I agree with all those things, Mir. But I’m definitely guilty of playing on my phone long after I was “supposed” to go to sleep. Maybe next time I’ll just sneak downstairs and have a midnight snack of cheesecake brownies instead of playing on my phone! Boy, the year is really flying by! I am not sure if I like time going so fast, but it will be nice to have spring and some warm weather. 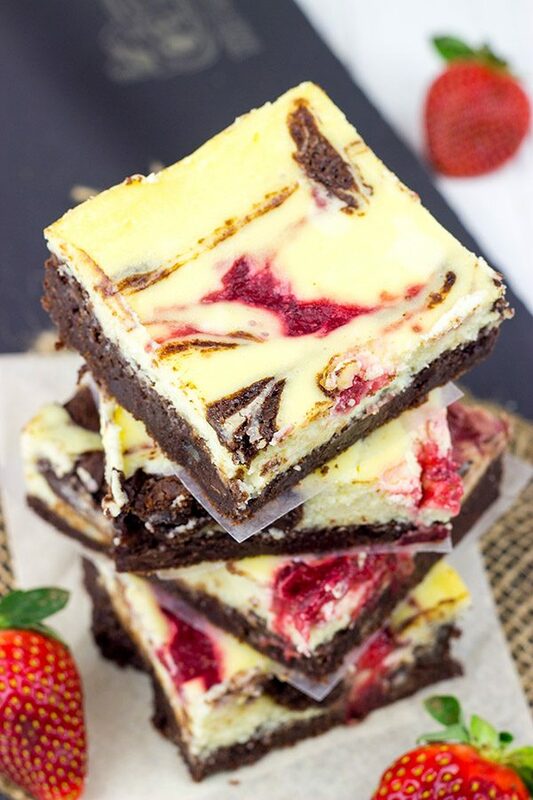 And as for these strawberry cheesecake brownies, I have one word to sum up this recipe…YUM!!!! Tell me about it, Dawn! We’ve gotten a little taste of warmer spring weather this week…and I’m now officially got spring fever! I know we’ll have some more cold days here, but I do believe I saw the crocuses peeking up out of the ground the other day. We’re close! !